I can't take credit for this line. That goes to a friend of Dr. Tony, who was a co-worker at one of my numerous various jobs before I became a teacher. This line is a good one for someone who likes to sing, but who others don't like to listen to. Like 95% of the Karaoke singers here in Asia. After Dr. Tony told it to me, I waited impatiently for the right time to use it. That came one day at "The Girls House". 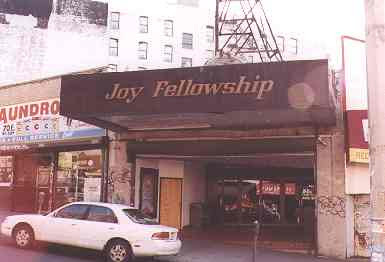 It is a house for women in need, run by my Church in the Bronx, Joy Fellowship. I was invited to join them for dinner one Sunday after church. We had a nice time of fellowship. Afterwards, the dishes were being washed, chores and devotions were being done, and I was letting my food digest. Andrea P. , who was in charge of the house, put some nice uptempo gospel music on the stereo. Unfortunately, she decided to sing along, with a sort of spirit-filled bellow. This was what I had been waiting for. Even though I already knew the answer, I innocently asked, "Andrea, who sings this song?" "Helen Baylor. Do you like it?" "Yeah, it's a nice song. Do you know why Helen Baylor sings this song?" She looked at me wide eyed, like she'd been shot. Then she said confidently, "Well then- she sings it to Worship Jesus!" "Of course she does! . . . You don't think she sings this song to praise God or worship Jesus?" "Oh wait, let me see- Oh, ok, it's probably something cynical- is it for money?" She started getting more and more indignant, with every answer that I replied in the negative to. "Oh, it's got to be some sort of man thing. Some sort of male chauvanist pig thing. Is it because she's a woman?" "Is it because she doesn't know any better?" This went on a few more times, until finally, she'd had enough. With fire practically flying from her eyes, and her teeth bared, she looked as if she was going to strangle me if I said "Nope" one more time. "Ok Smarty, tell me- why does Helen Baylor sing this song?" "So you don't have to!!!" I ran out of the house as fast as I could, and with good reason.